Today the highly underrated innovator dropped a huge bomb outside of Tim Cook's newly polished CEO suite: a $199 tablet called the Kindle Fire that by all accounts is going to be a very, very viable competitor to the $499 iPad. This is a stunning, stunning move and exactly the type of competition we need to see in the tablet space. HP's debacle of a tablet effort, powered by Palm's WebOS, was a complete disaster, selling only about 25K units of Best Buy's 270K total inventory -- until the company announced it was liquidating them for $100 each. Then they sold like hotcakes. Think about that: HP's discontinued tablet sold like hot cakes, proving that price is the biggest hurdle in tablet space. You see, the tablet market has been artificially held back by Apple's squeezing a delicious almost 40% margin out of the product (there's $200 in profit in every iPad). The iPad does not replace a computer or a smart phone, so if you're getting an iPad, you are rich or you've got a really dangerous technology addiction that you need to get help for. Casual users are not going to spend $1,000 on a laptop, $1,200 a year on an iPhone (with their dataplan and initial outlay), and then drop another $599 + $300 a year on a second dataplan. Folks in our industry will waste big money on these tech toys, but the rest of the country is going to make rational decisions like, "Why would I spend $499 on a tablet when I can use my laptop or smartphone to surf the web and play 'Angry Birds'?" They don't know the power and beauty of tablet computing -- but now they will. Clearly the visionary, Bezos realized this opportunity and decided Amazon will go all in: giving the product away at cost -- or perhaps even at a slight loss. The Fire's marketing is brilliant: it's all about content. It's not about specs, or Flash or even the App Store. It's about books, movies and TV shows. It's about Amazon's free movie and TV streaming service for Amazon Prime subscribers (if you don't have Prime already, spend the $70 -- it pays for itself after four or five orders). Ever more so with its streaming service. As I wrote, the tablet will be your -- and everyone else's on the planet -- primary consumption device in the next three years. To market this as an extension of Amazon's book and DVD business is just so, so, so brilliant. Included in the announcement is the promise of a little geek heaven: faster web browsing. How? Amazon has a new "Silk Browser" technology which is, actually, not new at all. It's client-server and link-fetching to speed up the delivery of your web page. This means if you're on the NYTimes.com they have, in their cloud and possible already on your device, the next five pages you're going to click on. They know this because the last five folks to hit the NYTimes.com's homepage opened those pages. These kind of caching services have a ton of privacy implications, as they are now sitting between you and your favorite p0rN site... I mean, political activism site! Not only do they have an entire history of which URLs folks are downloading, they have the actual download. I wonder if Amazon will allow users and webmasters to turn this feature off or not? 1. Release a smaller footprint iPad for $299. Something you can hold comfortably with one hand like a Kindle Fire. 2. Reduce the price of the full-sized iPad to $399 -- perhaps even $349 -- after Christmas or in the spring. How Will Google and Microsoft Respond? Google and Microsoft are both going to push hard into this space in the coming years, and I fully expect them to look at tablets as a loss leader that will push their search engines, email services, applications and app stores/marketplaces. Look for subsidized devices from both players in the next year, as Google and Microsoft will be in serious, serious trouble if Amazon and Apple control the primary consumption devices -- and their marketplaces. Chromebooks? Netbooks? Garbage! They are not important. Folks don't want underpowered, crappy laptops. Give them high-powered tablets with zexy, zexy screen resolution. In fact, if Google and Microsoft don't get their act together and get really solid offerings in the market, they might have an impossible task of catching up. 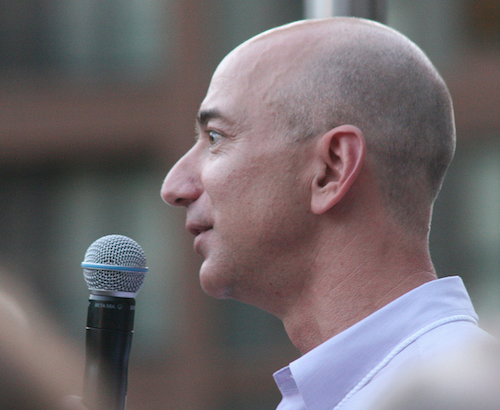 Jeff Bezos is a disruptive maniac and he's causing massive agita inside of Apple right now. Could anyone out there 10 years ago have predicted that Apple's biggest concern would be Bezos and Amazon? I ordered two Amazon Fires. Tablets are going to change everything. I really do love this game! PS - The tablet event we're hosting on Oct. 21st in Mountain View just got a LOT more interesting. I'm going to reach out to Bezos and see if I can talk him into coming down for a fireside chat. Join us at LAUNCH 'PAD: The Tablet event.